While the National Indian Gaming Association presented the annual Mid-Year Conference and Tradeshow with spotlighting issues related to Indian gaming and specifically the potentials of Sports Betting, other special events and gatherings were part of the successful Indian gaming show. The 2018 NIGA Mid-Year Conference was held at the Pechanga Resort & Casino in Temecula, California in Temecula, California with record-breaking attendance, and to kick off the annual event on Tuesday, September 25 attendees were greeted with a Welcome Reception, atop the beautiful resort, where Victor Rocha and his band Inkompliant took to the stage to entertain the crowd. As part of the mid-year welcome reception retired U.S. Senator, Ben Nighthorse Campbell (R-CO) was recognized with a special leadership award for his continued advocacy on behalf of tribes and tribal government gaming. In 1988 when the Indian Gaming Regulatory Act was being debated, Campbell was a member of Congress and helped to educate other members on the importance of Indian Gaming to Tribal Governments and our communities. National Indian Gaming Association Chairman Ernie Stevens, Jr., said, “Senator Campbell has been a longtime advocate and champion for all of Indian country, His work as a Congressman and Senator and as an advocate for Indian Country after his retirement from the Senate makes him a champion for the protection of Tribal Sovereignty and an advocate for Tribal Economic Development. For the first time since the movie was released in 1998, cast members and the director came together to celebrate the cultural touchstone, which was the first feature film to be produced and directed by Native Americans as well as showcase an almost exclusively Native American cast. In the photo, L-R Steve Gaydos, VP and Executive Editor of Variety discusses the 1998 award-winning film Smoke Signals with Native actors Gary Farmer, Evan Adams, Elaine Miles, and director Chris Eyre. 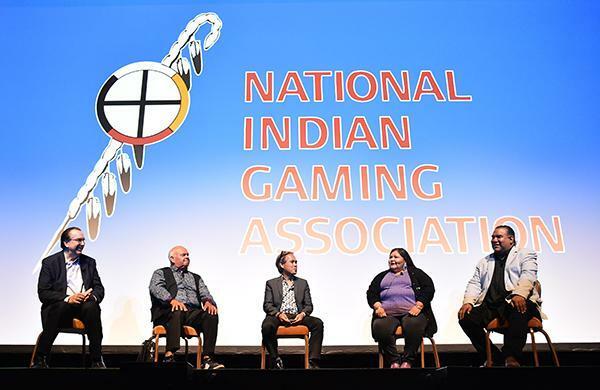 On the eve of the conclusion of the NIGA-Mid Year event, NIGA hosted a discussion and screening of the award-winning movie Smoke Signalsin honor of the film’s 20th anniversary. For the first time since the movie was released in 1998, cast members and the director came together to celebrate the cultural touchstone, which was the first feature film to be produced and directed by Native Americans as well as showcase an almost exclusively Native American cast. Cast members Adam Beach, Gary Farmer, Evan Adams, Elaine Miles, and Irene Bedard as well as the film’s director Chris Eyre, joined a discussion about the film and participated in a discussion moderated by Steve Gaydos, Vice President and Executive Editor of Variety, a weekly American entertainment trade magazine. “We are so proud to be able to celebrate the 20th anniversary of Smoke Signals. This film shows a strong display of Native American talent and culture, and more importantly, it is a film that takes us back to a nostalgic era and shows us how far we have come in this industry. I feel it motivates us all to continue to utilize this industry to educate the world about Indian Country. As we slowly erase the myths and flat out misrepresentations this industry instilled so long ago, we will take our place and share our history, our culture and our traditions from our own perspective.” NIGA Chairman Ernie Stevens told the crowd. More than 200 people joined in the anniversary screening event and discussions with the film’s cast, crew and producer. Following the Smoke Signals celebration, Gary Farmer (Smoke Signals Actor) and The Troublemakers Band performed in the Casino nightclub.